Hey everybody! Just taking Google's Picasa for a spin... So far so good, found all my photos and makes them easy to share. Here is the first mole captured in my backyard a few years back. 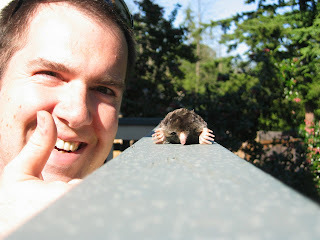 I was happy because I thought that I had solved my mole problem. Wrong! Check out the 'man hands' as Carrie calls them, on that little beastie. I believe I left him on the porch rail so Carrie could see it. I told her that there was something in the backyard that I wanted her to see... She wasn't too happy! At least I didn't find a little abandoned bird, herd it in to a bucket and show her while she was showering. That was later... I said "look what I found" and with perfect timing the bird went "CHEEEP!" scaring the daylights out of her. What a good husband I am! If this was a Pixar movie, you'd be the menacing (faceless) human that terrorizes the small animals in your backyard. Thanks for taking us to the 'Hawks game! It was a lot of fun (until the last minute).